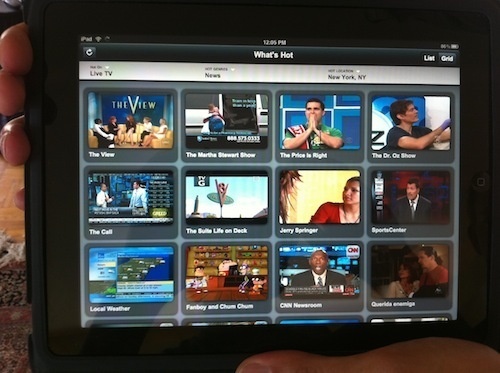 Verizon announces its plan to bring the full FiOS experience (including live TV) to the iPad and other mobile devices. Is this what traditional TV services need to fend off upstarts like Netflix and Hulu? Verizon announced today that it plans to bring the full FiOS experience to mobile devices, with Apple‘s iPad serving as a focus (and, notably, the demo unit). The details are scarce, but just the idea of a live TV app streaming to mobile devices is enough to bring up a host of questions. The app itself, demonstrated on an iPad but due for other platforms (likely Android, given Verizon’s sometimes scary friendship with Google), could well be a game-changer. Existing FiOS customers will have access to the entire catalog of channels, browsing live TV just as they would at home. There’ll also be a “What’s Hot” section, showing what nearby FiOS customers are watching. Some of the mobile aspects of the service, including the interface, aren’t totally clear yet. (Neither is the launch date, though it’s likely we’re looking at 2011.) But it’s clearly a revolutionary product. Pundits have been shouting about the death of traditional subscription cable services for a few years now, citing the tech-savvy viewers who replace FiOS or Comcast with Hulu, Netflix, and iTunes. A live FiOS app, if done well, would offer features totally unmatched by those upstarts. Live TV may be less popular than ever, but it’s still a valuable feature — especially for sports and must-see TV (think major finales such as the last episode of Lost). Netflix, with its massive back catalog of movies, would probably not be a direct competitor for this kind of service. But Hulu’s new Plus service might seem awfully inadequate in breadth and value next to the prospect of unlimited live TV. SlingBox, which very similarly streams live TV to computers and mobile devices, might also find itself lacking a competitive edge. Even Verizon isn’t immune to the fears of TV content providers, however. By the time the app launches, there may be some serious concessions. Service may be available over Wi-Fi only, which would be a major handicap, and demands for higher pricing could well result in an extra fee for consumers (though Verizon has not even hinted at charging extra). Verizon also noted one very peculiar restriction: At launch, iPad users will only be able to use the app while at home (presumably, while on a single Wi-Fi network designated as “home”). That’s a restriction that could well make the whole service useless–why even bother with a mobile app if it won’t be mobile? Wouldn’t it make more sense to just watch FiOS on, you know, your TV, if you’re at home? This sounds like a concession to content providers, and I really hope those paranoid providers will realize that making a mobile app that’s not mobile will hardly be a success. Verizon’s in ongoing negotiations with those content providers, and will hopefully be able to wrangle some sort of reasonable mobile capabilities. The app has nothing but potential–but it could just as easily fall on its face. Dan Nosowitz, the author of this post, can be followed on Twitter, corresponded with via email, and stalked in Brooklyn (no link for that one–you’ll have to do the legwork yourself).